Le Roux Cottage is situated in a quiet part of Clarens but still within walking distance of the village centre and sleeps up to six people, four privately and two on mattresses that are available on request. The two bedrooms are well appointed and have Queen beds, built in cupboards, a chair, a dressing table. Both bedrooms have their own access to the veranda. The two bathrooms are full en-suite bathrooms and have under tile heating. The open plan living area is very comfortable and opens onto the veranda through double opening doors, and features a large open grate fire place. There is also a gas heater and fan heaters in the bedrooms. The galley type kitchen is easily accessible to the living and entertaining areas, and is equipped with four-plate stove and oven, microwave, dishwasher, fridge freezer, toaster and cutlery and crockery. The house is fully secured and alarmed. There is parking is in the garage for one car, and the second car can be parked securely off the street in the property. The views are good and can be enjoyed from the enclosed veranda. 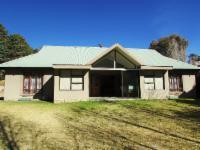 Le Roux Cottage is 2.3km from the centre of Clarens , the nearest airport 140.7km (Moshoeshoe I International Airport).